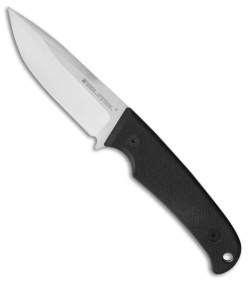 This Pointman model sports black G-10 scales and a satin finished blade. The Real Steel Pointman offers a high performance fixed blade for versatile everyday carry. Black G-10 handle scales and a full tang design. Swedish Sandvik 14C28N steel in a satin finish. Includes a black kydex sheath with an adjustable belt adapter.